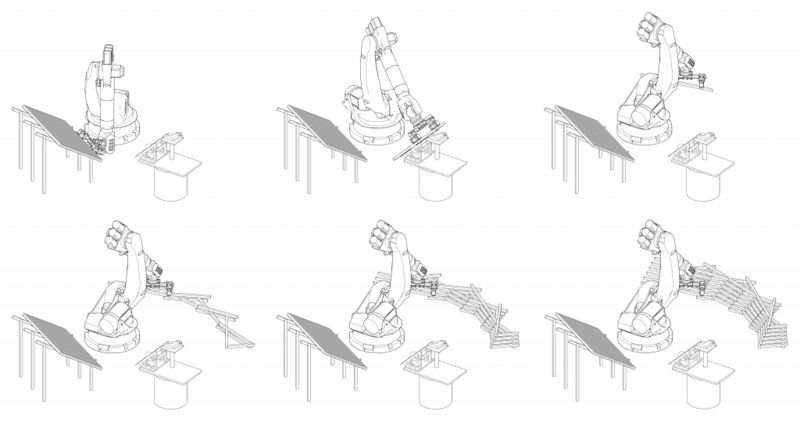 Fusta Robòtica is a research project realized as part of the Open Thesis Fabrication 2015. 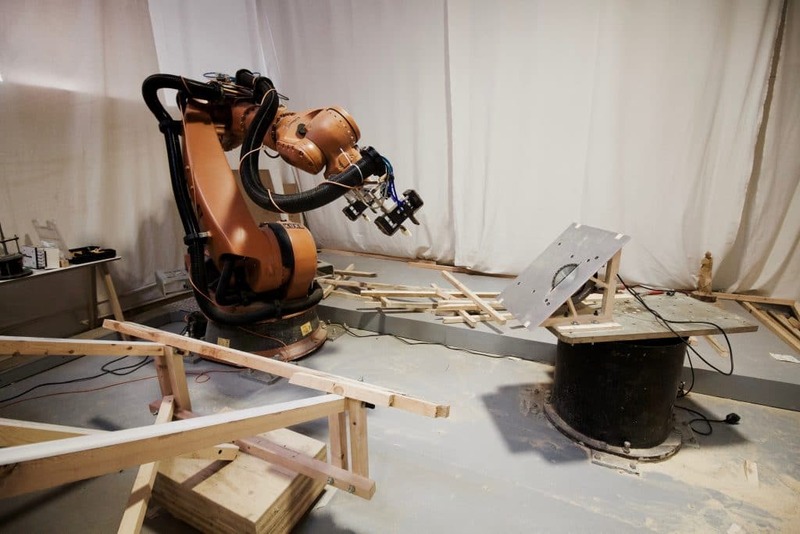 IaaC OTF 2015 Fusta Robòtica is an experimental project that proposes to overcome the challenges of building with Catalan wood – structurally unsound and highly deformable – through the application of parametric design and robotic fabrication processes. 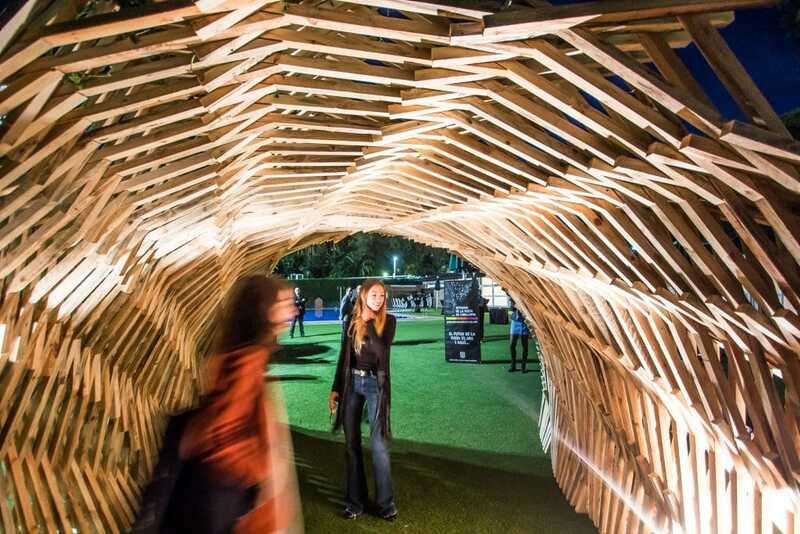 For the first time in Spain, robotic technology is applied to the design and installation of a one-to-one scale prototype entirely made of timber, achieving a parametrically controlled structural system. Catalan wood has the virtue of being a low-impact, Zero Kilometre material, however due to its tendency to warp while drying, it is solely used for palettes. 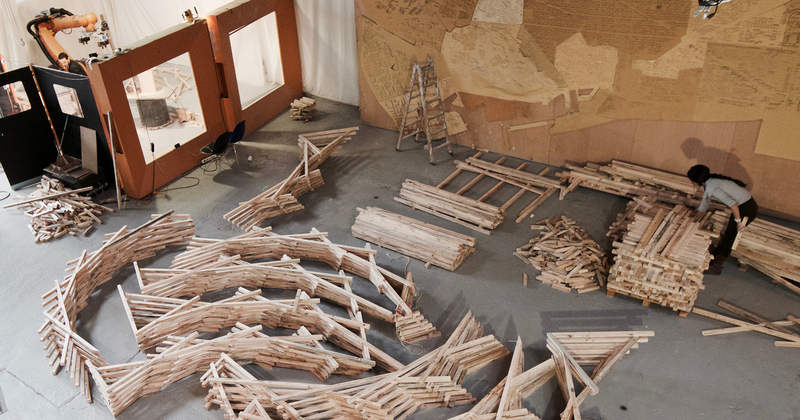 The challenge of Fusta Robòtica is to build a stable, large-scale prototype using this wood. 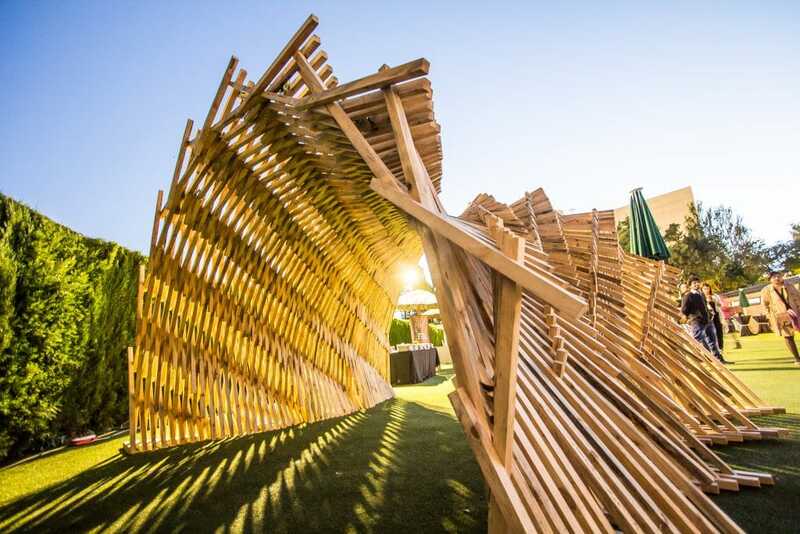 To overcome the limits of the material, green wood has been used to construct a redundant structure, capable of absorbing the deformations produced when drying. 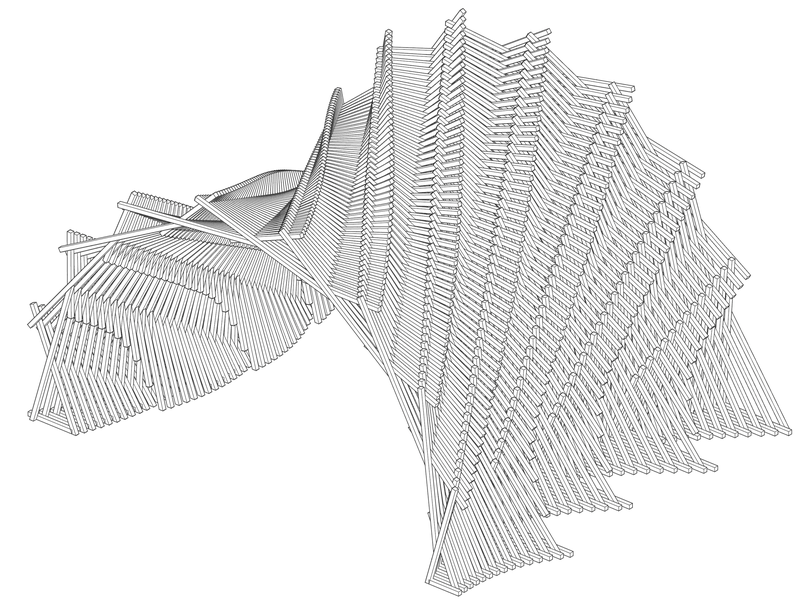 The design solution is based on incorporating thin pieces, as well as several diverse typologies of joints and triangulations, implemented through digital computation. The fabrication is done with a robotic arm, allowing to automate the assembly process as well as reducing any manual workload. The use of the robotic system ensures maximum precision and optimization of a complex construction process, an achievement that lays the ground work to revalue this building technique, usually discarded because of the manufacture and assembly costs. OTF students designed the wooden structure and programmed the 35-hour fabrication process that led to its realization. 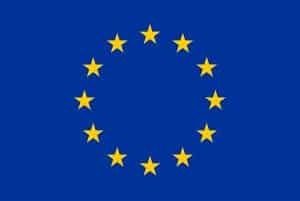 The exploration of the possibilities offered by robotic manufacturing protocols has been coupled here with the study of computational design tools and several material tests. The resulting system allows great flexibility of design in order to meet different needs, qualities of wood and contexts, without losing the process and structural efficiency. 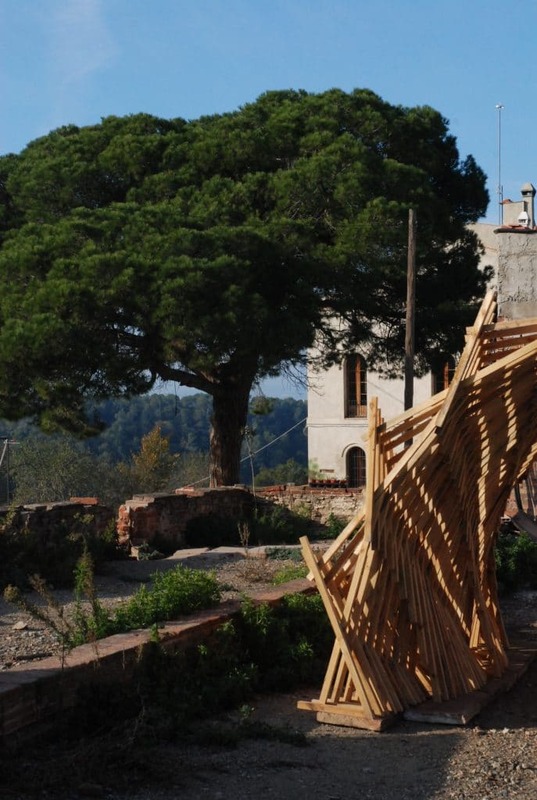 After being exhibited at the Setmana de la Fusta in Barcelona, the prototype has now been relocated to the Valldaura Labs in the Collserola Park. Students: Mohamad Mahdi Najafi, Fathimah Sujna Shakir, Nada Shalaby, Monish Siripurapu, Ji Won Jun, Josep Alcover Llubia, Yanna Haddad, Andrea Quartara, Angelo Figliola. in collaboration with, Gremi de Fusters, Tallfusta, Incafust, Mecakim, Decustik.